Real estate agents have some of the highest scores in job satisfaction out of workers across America. It might not feel like that when you’re working a 12 hour day just trying to get through all of the tasks on your plate, but it’s true: real estate agents are reportedly 28% more satisfied in their careers than workers in other professions, according to recent research by the Conference Board. 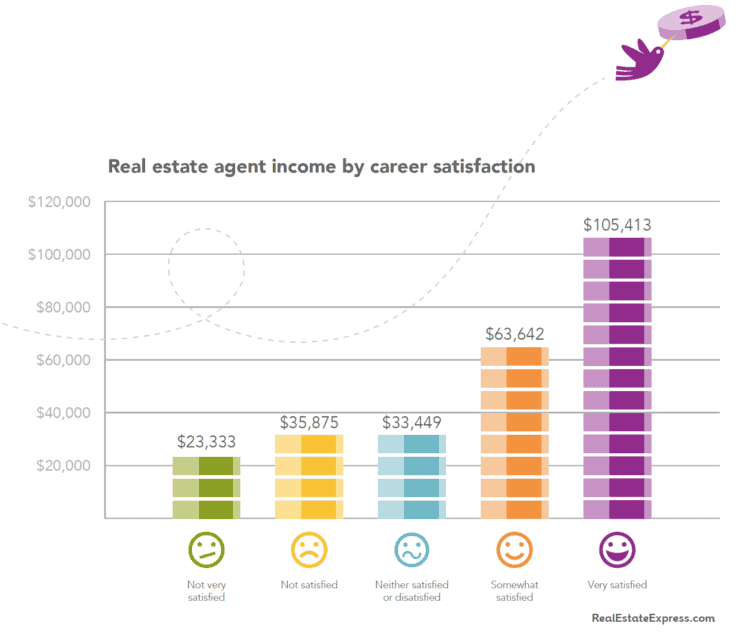 What Gives Agents Job Satisfaction? Real estate agents find a lot to love about their jobs. We surveyed agents across the country to find out what it is about being a real estate agent that gives them so much job satisfaction. Here’s what we found out. In total, 71% of respondents ranked this as the most important element that goes into their job satisfaction. Real estate is a career that you can balance with family responsibilities, school and side projects. Since you are your own boss, you can decide when to work and how many hours to work each week. This can make it easier to juggle several responsibilities at once. When you work as a real estate agent, you’re helping people make the most important financial decision of their lives. You’re also helping them find homes where they will create cherished memories for years to come. This gives many real estate agents a high amount of job satisfaction. In fact, 63% of those surveyed ranked this as something important to their enjoyment in their careers. They know their work matters. When surveyed, 61% of respondents ranked this as an important factor in their job satisfaction. In real estate, there’s no cap on your income. If you facilitate large transactions or have a higher volume of transactions there’s potential to earn more and more. Top-earning real estate agents have similar strategies to earn more money than their competitors. FREE Guide: Expand your earning potential with our 2018 Real Estate Agent Income Guide. Not having to answer to anyone else can be freeing for many workers. In our survey, 52% of respondents said this was important to their job satisfaction. When you work in real estate you’re in business for yourself. You make decisions on how to operate your business, when to work and what clients and vendors you’ll work with. An on-the-go work environment is something that 43% of real estate agents listed as key to their job satisfaction. Real estate is always changing and no two days are the same. Clients and properties are constantly coming and going and your tasks each day are rarely repetitive. It’s so easy to experience agent burnout and knowing why you’re in real estate and what elements of the career make you happy are critical to feeling satisfied every day. If you’re having trouble being satisfied with what you’re currently doing, think about which elements of the real estate business are important to you personally. Then, make sure you’re maximizing these throughout your working day. Since research shows your income increases the longer you stay in real estate knowing how to find satisfaction in your career will pay dividends in the long run. Our survey showed that real estate agents who are very satisfied with their job earn about $80,000 more per year than those who aren’t very satisfied. If you’re finding yourself unsatisfied with your work in real estate, before making any drastic decisions try to evaluate if you’re experiencing real estate agent burnout. To help agents we’ve developed a resourceful post with information on burnout. Reach out to those around you who can support you to tackle your discontent and get to the root of it.